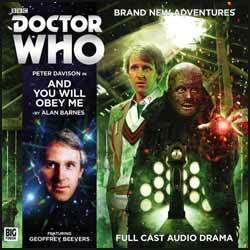 You may be forgiven for wondering what Peter Davison is doing appearing in this release. Didn’t we just get to the end of a Fifth Doctor trilogy? Well, yes, we did, but this is a new trilogy, and it is themed around the villainous Master, rather than a particular Doctor. However, as Alan Barnes’s story opens, it appears that the Master is dead and gone, the house where he has been hiding out burned down, his grandfather clock TARDIS put up for auction. But he can’t be dead – can he? For one thing, the Doctor has already encountered the villain in a later incarnation. Not forgetting the fact that the Master is incredibly devious and extremely good at cheating death. That’s only the first mystery of many that Barnes sets up and keeps adding twists and turns to. Others include a baffling array of individuals and organisations that are looking for the Master for one reason or another – teenagers who seem to serve him, alien dragonflies (whose memorably humming, hovering voices have been ingeniously worked out between actors Peta Cornish and Nick Ellsworth, director Jamie Anderson and sound designers Richard Fox and Lauren Yason), Russian soldiers armed with Gallifreyan stasers (best Doctor Who gun sound effect ever), and others. Even the Doctor suddenly turns up where and when you least expected him at one point and may have you scratching your head for a time. For the Doctor, this tale is a side trip from his stopover in the village of Little Hodcombe between The Awakening and Frontios. However, much of the action takes place in Hexford, which appears to be nearby and previously featured in the Fourth Doctor’s Nest Cottage series of adventures from BBC Audio. For the Master, And You Will Obey Me is what Doctor-lite episodes such as Blink and Turn Left are for the Doctor: the villain isn’t actually there as a physical presence for much of the narrative, but his powerful influence is felt throughout. Some of the twists and turns are perhaps a little too baffling, and I occasionally lost track of which of the young characters was which among the Master’s numerous pursuers… but everything is explained in the end and the whole affair lends itself well to repeated listening. Plus it’s great to hear Peter Davison (all too briefly) confronting Geoffrey Beevers, a Master he narrowly missed out on meeting during the television series. All in all, this story gets the new trilogy off to a masterly start.